The breeding of dogs identified as genetic carriers of recessive disease is a hotly debated topic in the canine breeding world with many breeders firmly entrenched in their own personal approach to the issue. With increasing regularity, dog breeders and their clients are bringing genetic questions (including those about breeding carriers) to their veterinarians under the assumption that most veterinarians would be up to speed on the current information and genetic testing available. Unfortunately, at Paw Print Genetics we occasionally speak to breeders whose veterinarians have given them advice about breeding carriers that may not be in the best interest of the kennel or the breed. Given the large number of variables and differences between the way kennels are operated and the recessive disease risks of individual breeds, there is not necessarily a breeding approach that would be appropriate in 100% of cases. However, understanding some guiding principles and the potential ramifications of doing so, can help a veterinarian advise their dog breeding clients in a way that will help them meet their goals without increasing the incidence of recessive diseases in a kennel or in the breed. As a quick refresher, recessive inherited diseases are those in which an individual must inherit two copies of a mutated gene (one from each parent) in order to develop the associated condition. Dogs inheriting two copies of the mutation are typically not recommended for breeding because even if bred to a dog that does not have the same genetic mutation, every puppy from the litter would inherit a single copy of the disease-associated mutation, thereby increasing the frequency of the mutation in the breed population to a significant degree. Dogs inheriting one copy of the mutation from a single parent are considered “carriers” of the disease and will not develop clinical signs of the disease themselves. However, when bred with another dog which carries the same mutation, approximately 25% of the offspring will inherit two copies of the mutation and will be at risk for or affected with the associated condition. Therefore, in general, it is recommended to only breed a carrier to a dog which did not inherit the same mutation. Using statistics as a guide, this strategy is expected to result in a litter consisting of approximately 50% carrier offspring and 50% normal or “clear” offspring. Thus, avoiding the removal of the carrier dog and its unique combination of genetic variants that contribute to the overall genetic diversity of the breed while limiting the number of puppies born with the known, disease-associated mutation. But why is genetic diversity in a population important for overall health of the breed? It is easy to find examples of dog breeders in online forums or groups that have vowed to never breed a carrier of recessive disease. While it would be unwarranted to question the intention of breeders to make breeding decisions that they believe are in the best interest of their kennel or their breed, education from a veterinarian about the potential ramifications of preventing carriers from breeding might be helpful in situations where breeders wish to discuss this scenario in the clinic. The major concerns in placing breeding limitations on carriers revolve around the loss of genetic diversity through the unintentional creation of a genetic bottleneck; a well described phenomenon associated with a rapid decrease in population size. While genetic bottlenecks are most commonly discussed in the context of natural disasters, infectious disease, or major adverse climatic events resulting in death, removing large numbers of dogs from a breeding population via sterilization (or simply preventing them from breeding) can have the same effect upon the genetic diversity and overall health of a population, as they have essentially “died” when it comes to their ability to contribute to the population’s genetic diversity. As the population decreases in size and the remaining members of that population reproduce, the limited genetic variability remaining in the population means that any two prospective breeding dogs will be more genetically similar than the members of the population were prior to the loss of diversity. This is concerning in the case of dogs carrying recessive disease mutations because if any two dogs from the less diverse population are bred, there is a much greater chance of them both carrying the same recessive disease mutations. Thus, placing them at greater risk of producing diseased puppies than when the breeding population was larger. 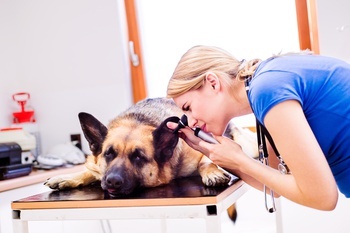 It is important to note that only a small number of disease-associated mutations are known in the dog. Therefore, genetic disease testing of prospective parents (and informed selective breeding based upon results) can only help prevent a small percentage of the recessive diseases that could potentially strike a breed. Maintaining genetic diversity serves as a passive preventative measure in limiting the chances of any two randomly selected dogs from the same breed producing diseased puppies. Removing carriers from a breeding population is particularly troubling in situations where the mutation associated with disease is common. A good example would be the disease known as collie eye anomaly or CEA (also called choroidal hypoplasia) which has been discovered in well over a dozen breeds, but most commonly in the collie. Estimates of the percentage of collies affected with CEA have ranged from 40% to 97% depending on the country and population studied. Keep in mind that these estimates are for dogs with two copies of the mutation (one from each parent) and doesn’t even account for the nonaffected, single mutation carriers of CEA which are usually found in a higher percentage than the number of affected dogs. As you can see, removing all carriers would essentially obliterate the population and the genetic diversity maintained within it. A major exception to the recommendation to breed carriers should be considered in situations in which a breed inherits a recessive disease mutation at a very low frequency in the population. An example would be a situation where a de novo, disease associated mutation has occurred in a specific blood line in the recent past. When the mutation is believed to be isolated to a small subset of the population, a plan to prevent the breeding of carriers (with the goal to eliminate the mutation from the population) may be a biologically sound and reasonable practice since eliminating a minute subset of the overall population from breeding is not likely to decrease genetic diversity to a significant degree. However, it is relatively rare for a mutation to be discovered early enough after its origin to consider a practice of immediate and complete elimination of the mutation. Often, an attempt to identify causal mutations does not occur until a disease has become a widespread concern for a breed club. Thus, potentially making elimination of the mutation impractical or detrimental to the overall health of the breed. As the number of canine genetic discoveries accumulate and genetic testing technologies continue to improve, the number of dog breeders and owners raising questions about genetics with their veterinarians are also bound to increase in frequency. With just a little knowledge of inheritance and why genetic diversity is so important to a population, veterinarians can play a significant role in educating their clients about the overall genetic health of dogs as we move through the 21st century. Per our continued commitment to our canine companions and those that love them, Paw Print Genetics is happy to extend our combined knowledge to any and all veterinarians that have questions about a particular clinical case involving inherited disease or that would like to learn more about genetic inheritance, specific inherited diseases, or general genetic principles. Our friendly, knowledgeable, and reliable veterinarians and geneticists are happy to answer any questions you may encounter in your practice, even if you haven’t ever used Paw Print Genetics testing services in the past. Please feel free to send us your questions to AskUs@pawprintgenetics.com or give us a call at 509-483-5950 during business hours (Monday through Friday; 8 am to 5 pm, Pacific time) to speak to one of our doctors!